The following is a detailed review for a joint pain relief cream called JointFlex. The goal of this product is to promote immediate and long term improvement of pain relief for those who sufferer from joint conditions. This manufacturer states that users of this product were able to nearly completely eliminate their joint pain and dramatic improvements were seen during clinical studies. This product provides an exclusive ‘Fusome’ technology that quickly and effectively penetrates the top 2 skin layers to target the pain at source. Read on to find more information on this product. Acetylated Lanolin, Acrylates/C10-30 Alkyl Acrylate Crosspolymer, Aloe Vera, C12-15 Alkyl Benzoate, Chondroitin Sulfate, Diazolidinyl Urea, Dimethicone, Dimethiconol Stearate, Disodium EDTA, dl Panthenol, Glucosamine Sulfate, Glycerin, Glycerol Stearate, Glycosaminoglycans, Hydroxylated Lanolin, Hydroxpropylene Methycellulose, Idopropynyl Butylcarbamate, Methyl Gluceth-20, Methyl Glucose Sesquistearate, Peppermint Oil, Polysorbate 20, Potassium Carbomer, Purified Water, Tocopheryl Acetate (Vitamin E). 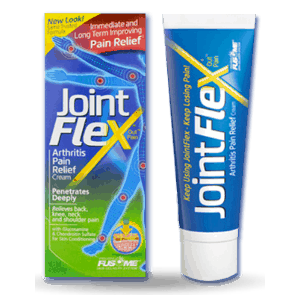 Apply generously to painful muscles and joints, gently massage until the JointFlex® Pain Relieving Cream disappears. Repeat as necessary, but no more than 4 times a day. There are no reported side effects for this product. The manufacturer of this product does not provide details of pricing on their website, which was slightly annoying. so we searched several sites to discover a 4oz tube of JointFlex retails from $10 – $15.00. We did not find any multiple purchase deals available for this product. JointFlex comes with a risk-free money-back guarantee. The manufacturer assures the potential customers that if they are not completely satisfied with the results they obtain, they can return the product for a full refund, no questions asked. They provide an address where to send the unwanted products to but dont state how long consumers have before the guarantee expires. We found some good positive reviews for this product which provides strong indication about the level of satisfaction and success consumers have found when using this product. JointFlex is made with both active and inactive ingredients. The list of inactive elements far exceeds the active ingredients, in fact, there is only one active ingredient – camphor. They also use Fusome technology for increased penetration of ingredients, and although this sounds impressive, we remain unclear exactly what this does other than apparently enhance pain relief. Clinical studies for proof of this are missing so, we remain skeptical. That said, the positive reviews we found support the fact that this product provides good pain relief. However, we felt that JointFlex was missing some key ingredients for preventative health care for eliminating joint pain and long term joint health. This is a shame as many other products out there provide significant elements aimed at treating the root cause of joint pain not just pain relief. So, all in all, we felt that this is a good treatment, that would work well but perhaps, most effectively, alongside another supplement that targets the root causes of joint pain and joint conditions. Click here to learn about our Top Joint Products. Mark Stevens	reviewed JointFlex	on March 7th	 and gave it a rating of 3.